Pasta lovers know there’s no specific season to indulge in a saucy bowl of carb-goodness, but it turns out there are reasons we feel like eating warm pasta in winter! Turns out colder temperatures may be the cause for the biological changes that seem to make us eat more, as well as craving more high-energy, and dense food in winter. Sunlight is one of the factors that contribute to the release of serotonin, and so it’s no surprise that in winter months, when we’re sun-deprived, we want to eat oodles of noodles when in a ‘seasonal slump’. Some experts argue that cooler weather may trigger an evolutionary survival tactic inside us, like many animals do, that fattens us up to endure harsh environmental conditions. Other theories reveal that the change of season may change the balance of some of the hormones that control hunger and appetite. But, the best theory is that pasta makes you happy! Yes, eating carbohydrates actually increases the serotonin levels in our bodies because of the insulin that gets released as a result, which explains why we get so giddy at the sights and smells of pasta! On top of all this, as we mentioned in a previous post, carbohydrates are our bodies natural choice for energy, so it’s a perfect and natural choice to keep us fueled and smiling throughout the chilly season! This curry-infused Neapolitan-based pasta has been keeping customers smiling since 1999! Made with garlic, chilli, rounded off with cream and garnished with fresh coriander, this popular pasta dish is an all-time favourite and winter treat, best enjoyed with chicken or prawns. The PRIMI signature seafood pasta is a mouthwatering must, packed with fresh prawns, mussels and calamari, pan-fried in olive oil, garlic, white wine, lemon, tomato, and chilli, and finished with gremolata. An ensemble of cheesy goodness, our homemade macaroni and cheese will take you back to your childhood. Our mac and cheese is oven-baked, and made with white cheddar, pecorino and blue cheese sauce, finished with gratinated pecorino, pangritata and spring onion. If you can handle all that cheese, add some mushroom and bacon or chicken! 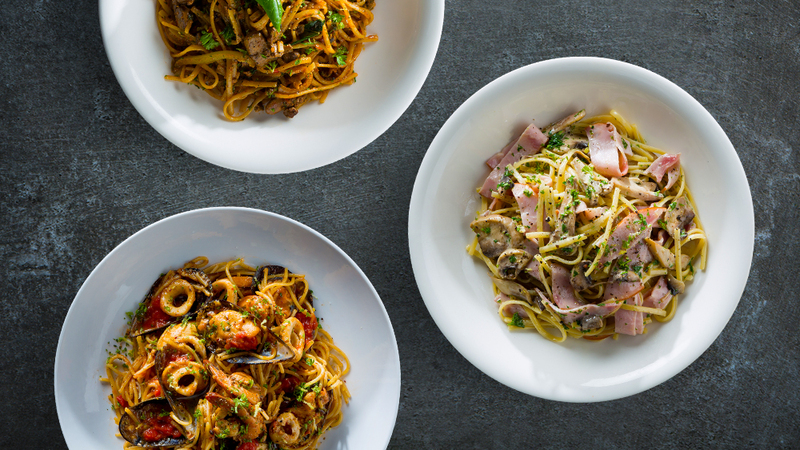 We know that has you salivating, so round up your friends or family and indulge in our July special where you can order any 3 pasta dishes and pay for 2, available between 5 and 7pm from Monday to Thursday!